We are leaders in our community, pro-actively reaching out to those in need. We collaborate and work with city agencies including Milford Department of Human Services and Milford Youth & Family Services and other organizations to help ensure health and safety. Wherever there is a need, we come together to provide – help in a catastrophe like Hurricane Sandy, to food, clothing, blankets and school supplies. We open our doors to so many - from groups needing to come together to battle addiction to providing an affordable, fun night out for families – something which is becoming more and more difficult to do as those struggle to make ends meet. We also help support critical ministries around the world, from education to disaster relief. We support the efforts of Church World Service (an inter-denominational relief agency) through gathering health & school kits. Did you know that we provided more school kits and backpacks filled with essentials to more children than we have members of our church? We are a small church with a BIG heart seeking to be “doers of the Word, not hearers only” (James 2:22). Please support us – every dollar counts. For each $5 donation, you will receive a wristband – a reminder that we should all open our hearts, minds and doors to everyone. Don’t forget to share this page with all of your friends and click the heart in our picture so as we update it with news of our community outreach, you can see your dollars in action! Also visit our website to learn more. Together we can make a difference. Jean Klink, our church council president, worked for Ernst Benzien for over 37 years. Throughout the years, Jean’s passion and love of her church, OUR church – The United Church of Christ in Devon, was apparent. Ernst is the former owner of the Encon Heating & Air Conditioning Company of Stratford, CT, a company he founded in 1969. From a small staff, he built the company to be a leader in residential and commercial HVAC solutions along with solar, geothermal and other energy solutions serving Fairfield County, CT and Westchester County, NY. Jean began her employment in 1970 as part of the company’s office staff until her retirement in 2007. When Ernst became ill, Jean made him a prayer shawl, a prayerful hug to provide comfort that was blessed and dedicated during worship accompanied by prayers. Ernst, always known for his generous support of his employees and co-workers, made an extraordinary gift to the church in honor of Jean. We thank Ernst for his generous contribution and pray for him as he wages a battle with cancer and leukemia. God Bless You, Ernst Benzien. The Salvation Army service unit in Milford expressed a need for backpacks and supplies for students and The UCC in Devon stepped up. 25 are filled with all the essentials these awesome kids will need to be set for success - something no child should worry about. Thank you and blessings to all who helped make this happen! Read more about how we serve the community and beyond and how you can get in on the action! Meet Kathy, Mike and Julia Attruia as they share their thoughts and feelings about The United Church of Christ in Devon. May God Bless them as they begin a new chapter in their lives. They will forever be a part of our church family! LOVE LIVES HERE! Did you know that each year the Salvation Army service unit in Milford expresses a need for backpacks and supplies for students? Did you also know that each year The UCC in Devon steps up to provide? 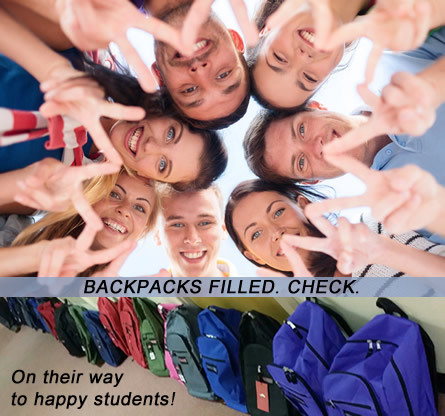 This year, 25 high school teens will receive backpacks filled with pens, pencils, erasers, highlighters, numerous notebooks, a binder and paper, folders, folder tabs, index cards and flash drives! All the essentials these awesome teens will need to set them up to have a successful year in school. Something no child should worry about. All backpacks are dedicated during worship service prior to delivery. 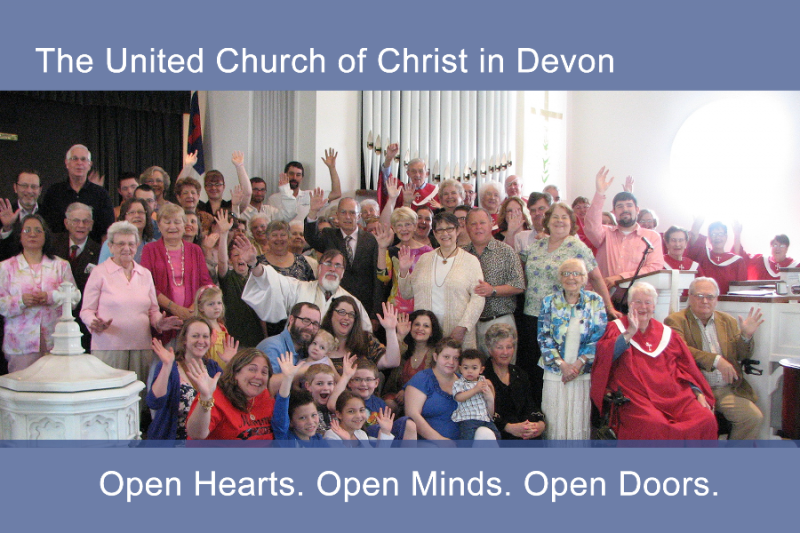 I am praying the United Church of Christ in Devon can keep it's doors open. Donate this amount and receive an Open Hearts-Minds-Doors wristband! Donate this amount and receive an Open Hearts-Minds-Doors wristband AND a hug! Donate this amount and receive an Open Hearts-Minds-Doors wristband, a hug and a UCC in Devon t-shirt! Donate this amount and receive a wristband, a hug, a t-shirt and and your name in lights on our website. Donate this amount and receive a wristband, a hug, a t-shirt, top billing on our website and free admission for four to 3 movie nights! Donate this amount and receive all of the items listed in platinum level PLUS your name/logo printed on all marketing materials and social media. Talking up Open Hearts. Open Minds. Open Doors. wherever I go! Grateful to our friends that hand us funds to support our wonderful church and church family!